"A Basket full of Joy"
Below you will see buttons that will give you access to an individual page of litters we have bred over the years. 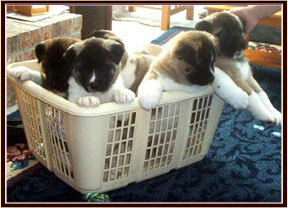 These litters are provided so you may see some of the puppies that come from Summit Akitas. Please enjoy your visit and contact us for any information. © Copyright 2001-2011, Summit Akitas.